Tonight, I had breakfast for dinner. Hubby was out and I didn’t want to make anything too difficult for just me. 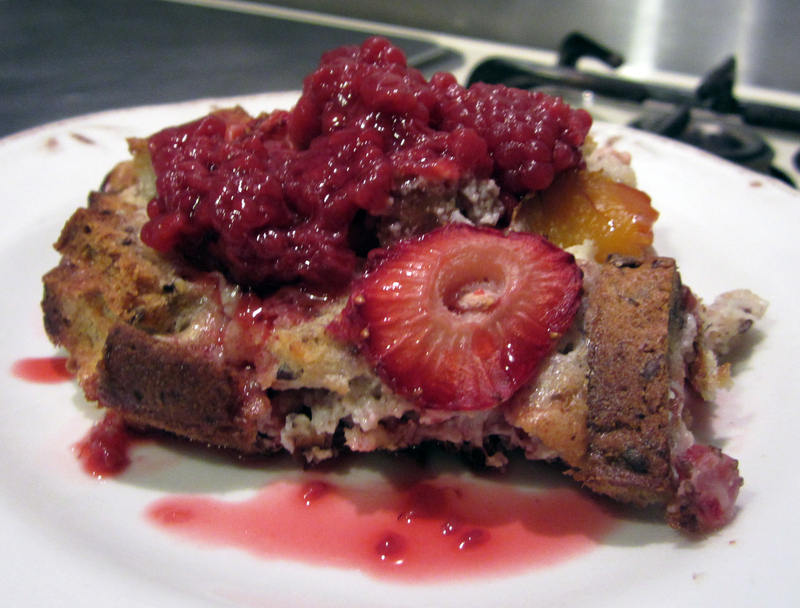 I had come across a couple of baked French toast recipes last week. I couldn’t make up my mind which one to try…the healthy Baked Peach French Toast or the Cinnamon Crumbled Baked French Toast (which was gluten-free). In the end, I decided to take bits and pieces from both recipes and come up with something of my own. I didn’t like the name, however, because I don’t think of French toast as something that is cubed and baked…that’s bread pudding, right? I collected my ingredients, but found that I only had 4 eggs. Both of the recipes called for 6 eggs and another 1/2 cup of egg whites. So, that is the first change I made…I just used the 4 whole eggs. One recipe called for milk and the other called for light coconut milk. Since I can’t eat dairy, you can guess which one I opted to use. The gluten-free recipe called for ground flax seed…I missed seeing it, but all was good…I was using Kinnikinnick Sunflower Flaxseed Rice Bread (I would have preferred Udi’s Omega Flax & Fiber bread, but Amazon Fresh didn’t carry it and I was too lazy to run to Whole Foods). I also added some sliced strawberries to the mix before popping it in the oven. 45 minutes later, the kitchen smelled heavenly, and my bread pudding was done baking. After I dished out some for my dinner, I remembered I had a jar of canned raspberries I had acquired at the last community backyard barter. It was perfect to top my bread pudding! Preheat oven to 375°. Whisk together all ingredients except bread and fruit. Spray baking dish with cooking spray or grease with coconut oil. Place bread into dish, add peaches and strawberries to the top. Pour wet mixture over the fruit and bread. Bake uncovered 45-50 minutes until center is not visibly liquidy. Top with fresh or canned fruit of choice when serving.